This wouldn’t be Frank’s Tech Support and Pretty Good Sandwiches without the occasional sangwidge, and since my boss was nagging me to fill this gaping hole in my blog, today I present to you a new twist on an old favorite. 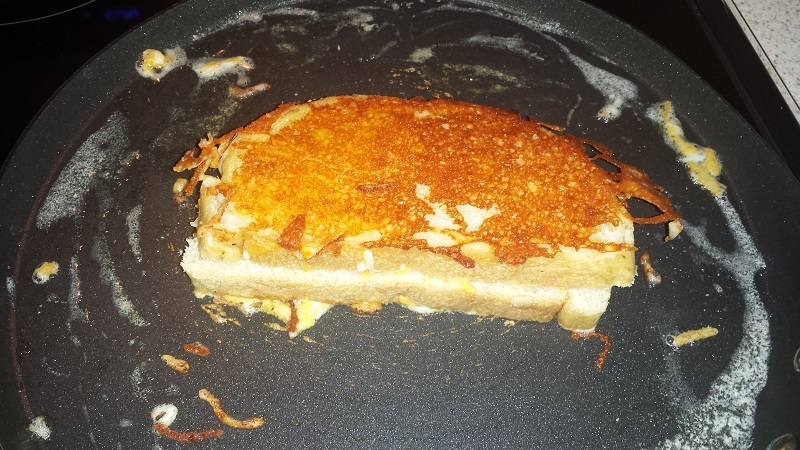 I call it the Inside-Out Grilled Cheese. 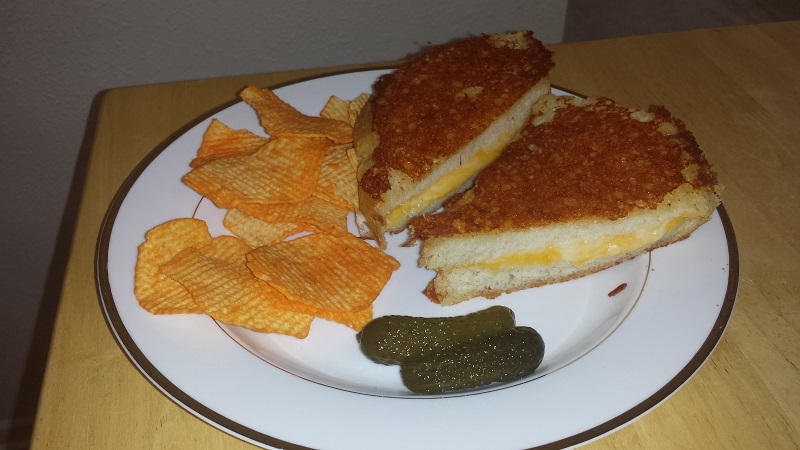 When I was growing up, my mom always made the regular kind of grilled cheese. You know, two slices of white bread and a couple of slices of Processed American Cheese-Like Substitute And Floor Tiling. I’ll be honest with you, served with a mug of tomato soup, it’s still comfort food and I’ll still make it from time to time. But we’re adults now and sometimes we want more out of our sangwidges. We want them to be Pretty Good, right? They don’t have to be great. I mean, let’s not get ahead of ourselves here. Do I look like Guy Fieri? No. I do not. You’ll just have to take my word on that. So let’s grill a pretty good cheese. First, forget everything you ever thought you knew about grilled cheese. Forget the Wonder bread and the plastic stuff in little wrappers that most people call “cheese”. You’ve been doing it wrong. We’re using real bread and real cheese here, people! Now that’s a pretty good sandwich. 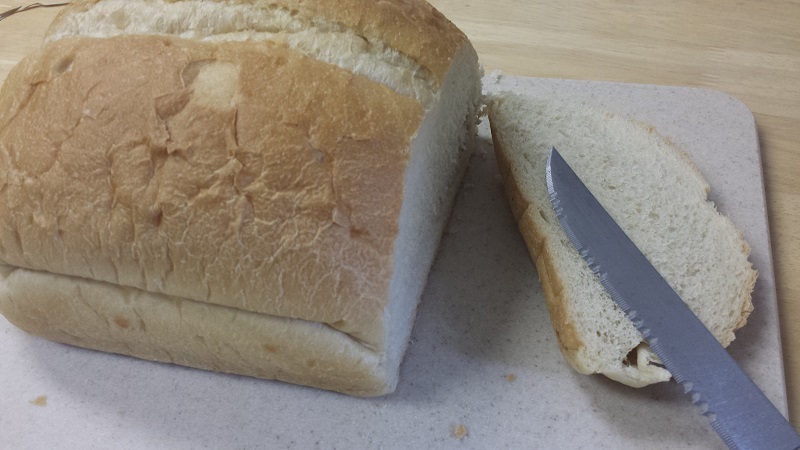 For the bread, I like to use a nice sourdough, not too thick. If it’s too thick, it’s tough to get your cheese to melt on the inside. For the cheese, be creative. You can literally use just about any kind of cheese. I’m partial to colby jack, but sometimes I’ll go all Swiss, gouda, havarti, or a combination of cheeses. Cheddar and Swiss mix really well here and the Swiss will gooey-up nicely. The great thing about this is that you can fiddle the recipe all you want and it’s really hard to screw it up. Maybe one time you try a nice hard French roll and another time a marbled rye. Use all one kind of cheese or five different ones. Your sangwidge will always be different and it will always be pretty good. Holy guacamole, just look at that delicious sourdough! Are you kidding me?! Our end product is going to be a nice, melty cheese between two slices of bread with crispy cheese on the outside. You’ll need a skillet heated on a medium-low setting. Melt about a tablespoon of butter in it. On top of the melted butter, place two slices of bread. On one slice, apply your cheese selection. I find shredded works best because it’s easy to mix with other cheeses and it melts readily but you can use sliced if you want. If you use shredded, I recommend shredding your own. Pre-shredded cheese in bags is coated with a powdery protectant for packaging and it’s just not as tasty as when you shred it yourself. For an extra kick, you can also add a little hot sauce (I recommend Frank’s Red Hot, naturally), Dijon mustard, pepperoni slices, or whatever you desire. Allow both slices to grill for about 30 seconds. At this point, we’re just trying to get the bread warmed up and the cheese a little soft. We don’t really want it toasted just yet. 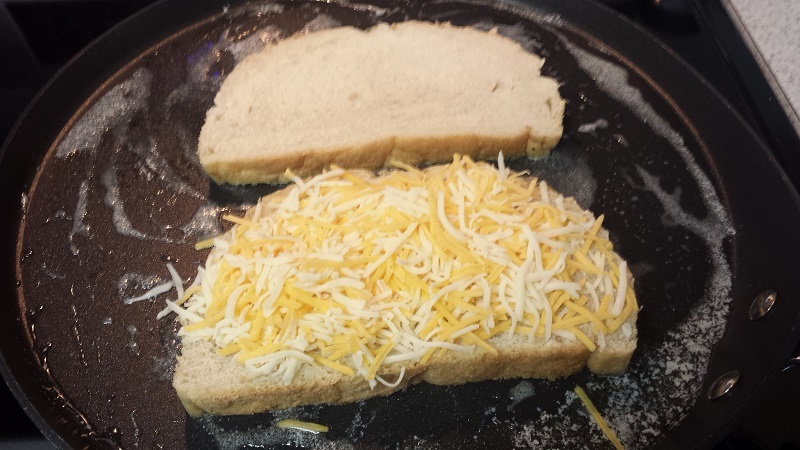 Flip the un-cheesed slice onto the cheesed one, butter-side up. Add more cheese to the top. Try to keep the outside cheese layer thin. You don’t want a big mass of cheese on the outside. The warmed butter should start to melt the cheese a little. When the bottom of the sangwidge has started to toast just a little bit, flip the whole thing over and apply cheese to the now-exposed uncheesed side. Allow the bottom cheese to start to crisp. It’s important that it gets a little crispy, not just melted. We want gooey in the middle and crispy on the outside. When it’s sufficiently crispy, flip it back over again and do the same to the other side. By this point, you should have a nice toasty crispy sangwidge with melty cheese in the middle. You may need to flip it one or two more times. Be sure not to burn the cheese before the center melts! Now you’ll have two similar flavors with very different textures. If you mix-and-match your cheeses, you can create some pretty good combinations. 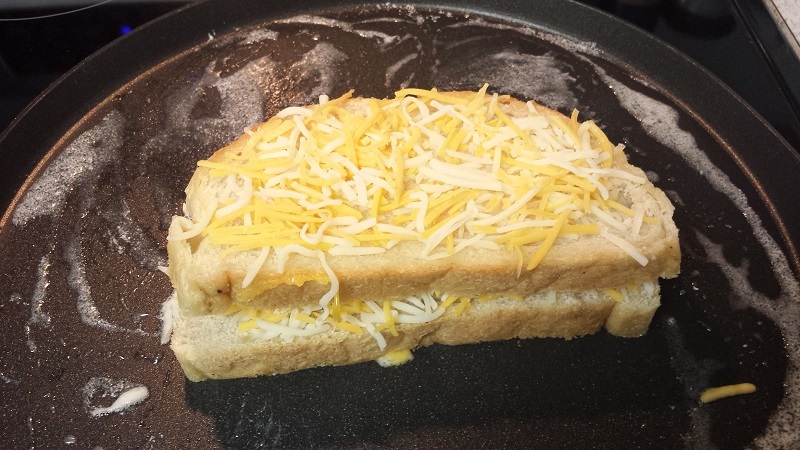 I like to use Cheddar on the inside and freshly-grated Parmesan on the outside. When the Parm starts to toast and you start to get that smokey smell off of it…fantastic. Don’t ever let me catch you using that powdered Parmesan on your inside-out grilled cheese, though. We only use real cheese around these parts, mister! Serve with chips and beer. I really like this sangwidge. I think it’s pretty good and I hope you’ll think so, too! Reblogged this on Peer2Peer Consulting. Wow, if mom made this for us (including the beer), we never would have run away and joined the circus, amiright?! We didn’t run away, you were kidnapped by carnies and we didn’t notice for two weeks. But otherwise, that’s more or less exactly correct.